The good people of Ireland's County Kerry call their region "The Kingdom," and well they might with such regal scenery around them. And if Kerry is indeed a kingdom, then that magnificent drive called "The Ring of Kerry" is surely one of the crown jewels. One of Ireland's, if not the globe's, most scenic tourist trails, "The Ring of Kerry" is a 100-mile route around Kerry's Ivereagh Peninsula that shouldn't be missed by anyone who visits Ireland's lovely south-west coast. The legendary town of Killarney, itself known for its beautiful lakes, can serve as the starting point for a one- or two-day drive "around the Ring" that you'll remember your whole life. 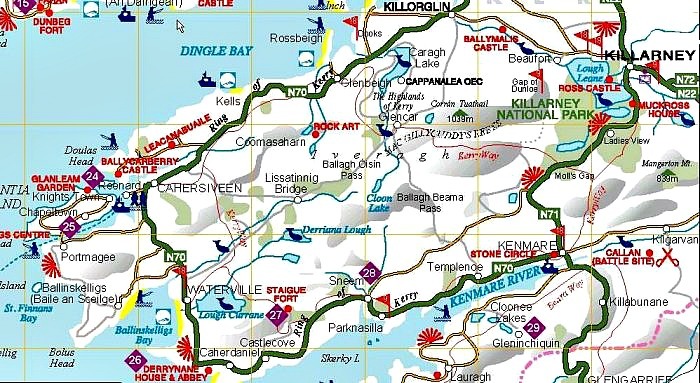 Since the route is a circular one, you can start in Killarney from either direction, but I prefer the northern route, via Killorglin, so that after your trek you can stay the night at one of the grand hotels in the village of Kenmare, on the peninsula's south shore. Killorglin is a market town, famous for its "Puck Fair," which started as a cattle and sheep sale, but has developed into a tourist attraction in itself. The three-day festival is held each year starting August 10. In addition to the market, the fair honours the saving of the town from Cromwellian troops in the 1600s, when a spooked Billy goat tipped off the townspeople that the British were coming. Today's Kerry residents, joined by many visitors, celebrate the goat's heroism well into the night at local pubs. From Killorglin, the scenic route cuts southward to Glencar, amidst lush hills that demonstrate why Ireland is known for its "forty shades of green." The road comes to the coast again at Glenbeigh, where a superb beach called Rossbeigh Strand provides a vista of beauty that is typical of the Irish seascapes. The cool breezes from the bay, even in summer, make the beach more popular for horseback riding than sunbathing. And what a lovely ride it is. Continuing west on the coastal road, through mountains that hug the sea, will bring you to the village of Cahersiveen. A statue in the village square memorializes an Irish Volunteer in the War for Independence, hearkening back to the small New England towns where a Revolutionary War soldier looks down on the village green. Off the coast of Cahersiveen is Valentia Island, where boats can be commissioned for a ride to the stark Skellig Rocks, a place of pilgrimage where Irish monks fasted and prayed during the Middle Ages. If time or weather do not permit a side-trip to the Skellig Rocks, continue on from Cahersiveen along Ballinskellig Bay to Waterville, home of the Waterville Golf Links, one of the top golfing venues in the British Isles. 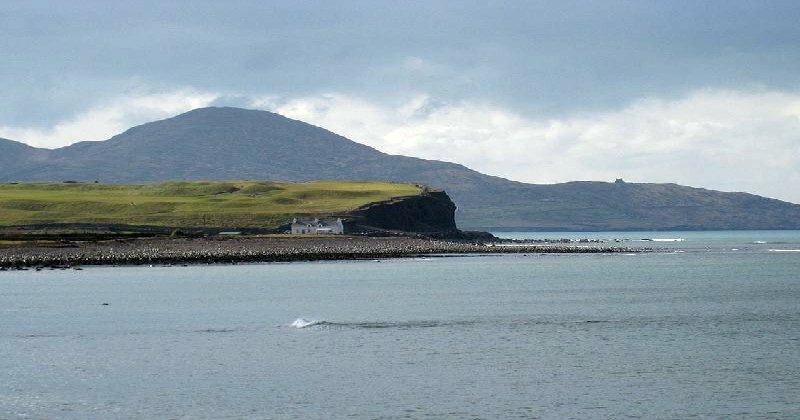 The area has historic significance because of its connection to "The Liberator," Daniel O'Connell, who campaigned for Irish Emancipation in the 1820s.The great orator, who was born near Waterville, prepared his speeches just south of the town in Derrynane, which has a marvellous scenic beach. The town was also known as a retreat for famed comedy film star Charlie Chaplin, who regularly vacationed there. An annual comedy film festival honours his memory, as does a statue in the town. Waterville was in the news for another, less positive reason last year, as news articles told of a cafe owner who had posted a sign in his window saying "No loud Americans." Many of the townspeople, whose livelihoods depend on tourism, were outraged. It was especially ironic since Jack Mulcahy, an American industrialist who was born in Kerry, invested heavily in the town, including the restoration of the Waterville Hotel and famed golf links. As you continue on the main road towards Sneem there is a detour worth taking down a narrow country lane to Staigue Fort, an ancient haven dating to the fourth century. As with many Irish antiquities, you will have "the run of the place," accompanied only by the ever-present sheep, as you muse about pirate raids and wars past in the now peaceful countryside. The village of Sneem itself has many roadside shops and cafes where you can stop for afternoon tea on your journey. It also boasts one of Ireland's great old hotels, the Parknasilla Great Southern, a 19th century mansion set amid subtropical gardens. The palm trees here, though rare in Ireland, are typical of Ireland's Ivereagh Peninsula, which is warmed by the Gulf Stream. The Victorian style hotel was built when well-heeled British visitors enjoyed seeing the Irish countryside from railway cars. All of the Great Southern hotels in Ireland followed the same style, serving as familiar stopovers offering comfortable amenities to the tourists of that era. Dinner at the hotel's Pygmalion Restaurant, one of Ireland's most elegant will make you feel like one of John Bull's upper crust. Continuing along the route by the Kenmare River brings you to Tahilla, a quiet village that has been a retreat for Irish politicians and European diplomats. Then comes Kenmare, one of Ireland's picturesque "tidy towns," a centre for some of the best freshwater and saltwater fishing in Erin. If you've already toured the Lakes of Killarney, you might want to spend the night in Kenmare before continuing on to Cork that is if your Irish itinerary is following the tried and true route around the southern coast to Dublin. Among the hotels that will surprise you in little Kenmare are the Kenmare Bay Hotel and the landmark Park Hotel. If your journey is continuing to Cork, and if you're not a timid driver, you can take the eye-popping route over the mountains via the Healy Pass to Bantry Bay, but only if you're an intrepid driver and the weather is good. Otherwise, you can travel back to Killarney by the less arduous Moll's Gap, and you'll find modern highways (called national roads in Ireland) from there. "Rounding the Ring" is a staple of any visit to the Emerald Isle. And any tour of the kingdom of Kerry, like a wedding, wouldn't be the same without it.